Posted on June 18, 2013 Posted in 2013, Social Media, Tourette Syndrome, TSFC, Twitter	. Have you ever had an itch that you just couldn’t scratch? Something that started off very small and you just tired to ignore it. But the more you ignored it, the worse the itch became. It just stayed and stayed and got worse and worse. Creeping out until the itch was much bigger than it originally started. And then, even though you couldn’t really scratch it properly, you couldn’t wait any longer and just had to try and relieve the feeling? Well that’s what it can sometimes feel like for someone who has Tourette Syndrome (TS) and they’re trying to hold back a tic. I’m speaking from personal experience here. Everyone has different tics and they can range from something as simple as wanting to touch a door four times, wanting to wiggle your nose, or needing to yell out a word or phrase. Posted on May 23, 2013 Posted in 2013, Family, Nostalgic, Parenting, Throwback Thursday, Twitter	. An online meme that I’m seeing more and more is Throwback Thursday (or #ThrowbackThursday on Twitter). It’s inspired me to dig up some old photos. Some of the photos I’ll share will be ones that were in the wedding slideshow that Matt and I had back on 07-07-07 (or “Seven cubed” as we nicknamed our special day). Posted on May 6, 2013 Posted in 2013, blog, Facebook, Social Media, Twitter	. Early Sunday morning (although for me it still felt like Saturday because I had yet to go to bed and it wasn’t long after midnight…), I shared a photo that I took on Saturday of Matt and Miranda in honour of Star Wars Day (AKA May the Fourth be with you). I managed to get picked up by NL Blogger’s Daily through a tweet I posted sharing the blog post. This is generated through paper.li and it’s a way you can create your own online newspaper. Once you set up some parameters, you can can automatically find, publish and promote articles, photos and videos from across the web. It’s an interesting concept and I’ve seen some various people using including some parenting bloggers and other industry-specific social media accounts (primarily on Twitter). 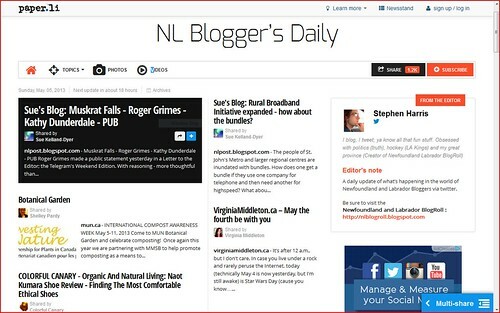 NL Blogger’s Daily is something that Stephen Harris (@seliharris) of @NLBlogRoll has and I tend to give I quick look now and then since it’s a great list of local blogger updates. It’s always interesting to see when social media channels crossover. I think it helps to keep conversations going. It adds an element of fluidity to the whole thing. Maybe you see a news article on Twitter and there’s a hashtag you can follow to read what others are saying. Then you pop over to Facebook and see other people talking, commenting and sharing information about the same topic. The conversation continues. How often will I recall a piece of news I read, yet I’ll have difficulty remembering if it was originally read either in a news alert, an post on Facebook, a tweet on Twitter or on a website or online news service. Sometimes this can cause repetition and a lot of noise. And often it can cause certain news stories to seem more important because people active in social media are either sharing the information at a higher frequency, or you just notice it more because you’re not hearing about the other stuff that’s floating around in the news world. What’s your vagueness plan social media guru? Posted on September 27, 2012 Posted in 2012, Comics/Images, Dilbert, Facebook, Marketing, PR, Social Media, technology, Twitter	. I’ve had colleagues, friends and family call me a social media guru, ninja, expert, etc. In fact, I’ve had a post/rant in draft form for months and was inspired by today’s Dilbert comic to finally move it from draft to publish.